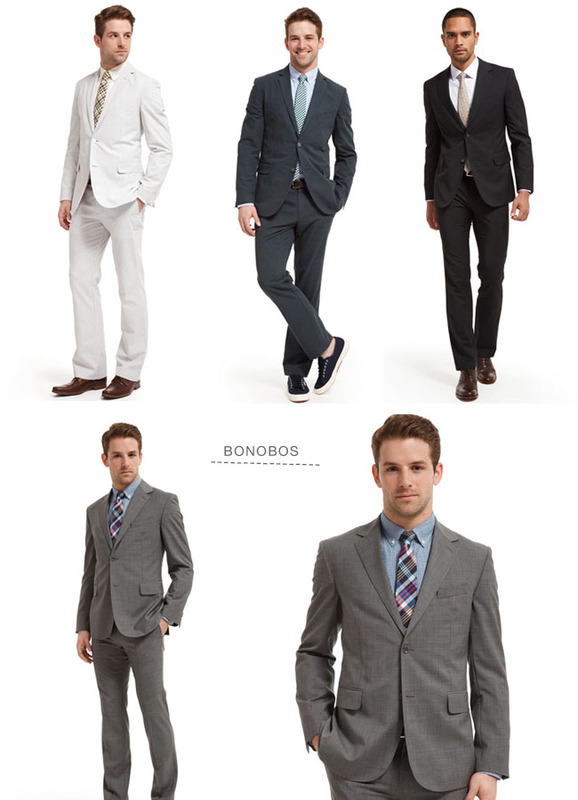 First up is Indochino above and Bonobos below. 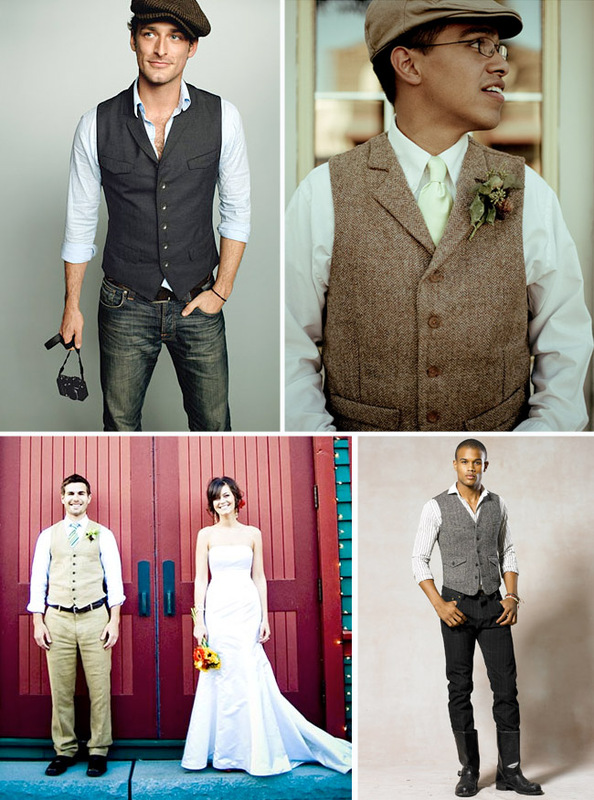 Both offer lots of great selections for the groom including suits, pants, jackets and vests. 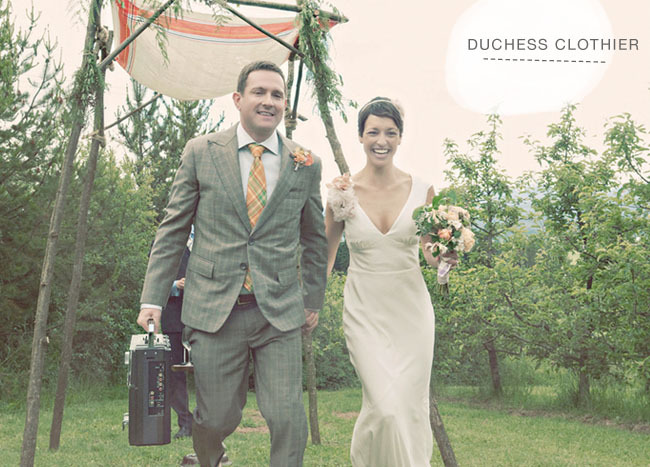 If you are looking for a custom suit, check out Duchess Clothiers (in Portland) or Thick as Thieves (in Los Angeles). 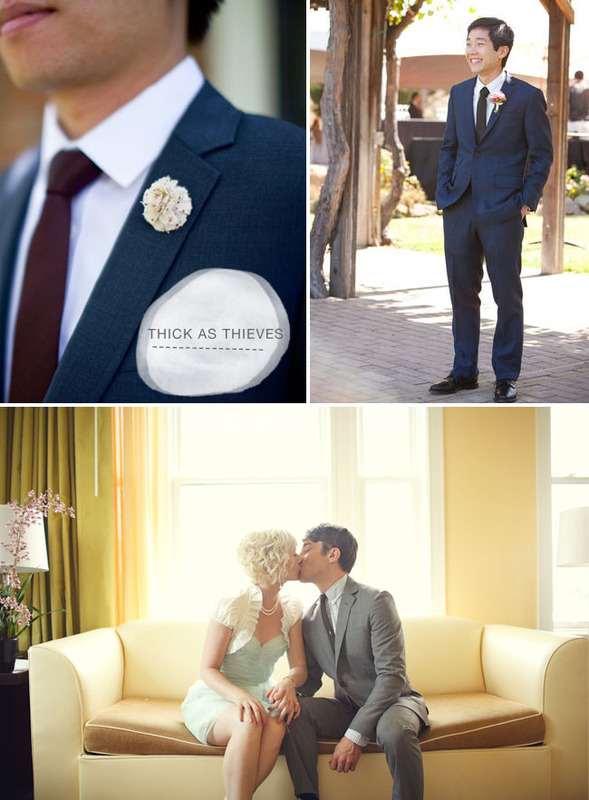 I’ve featured numerous grooms sporting suits from both these places and they always looks so great! 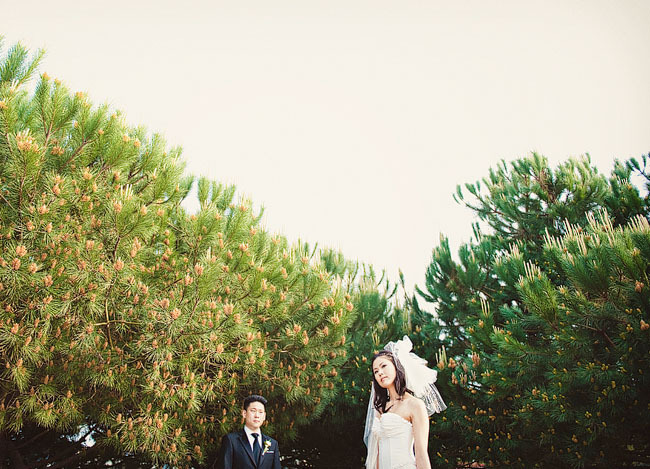 The groom above is from this wedding and the groom directly below was photographed by Jessamyn Harris and the couple below from this wedding. The part of your look where you guys really get to have fun is with your tie! 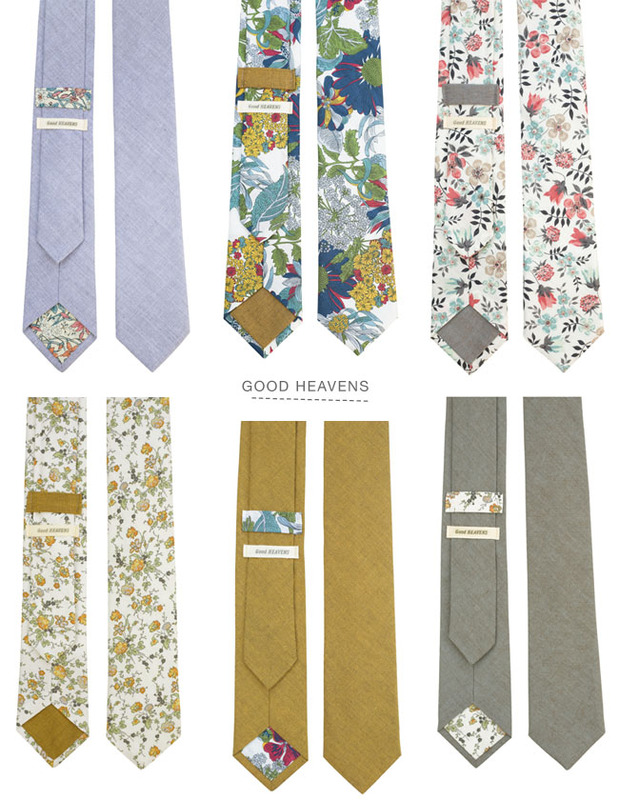 Why not really make a statement with one of these limited-edition ties above from Good Heavens or a fun bow tie like these below from Forage. 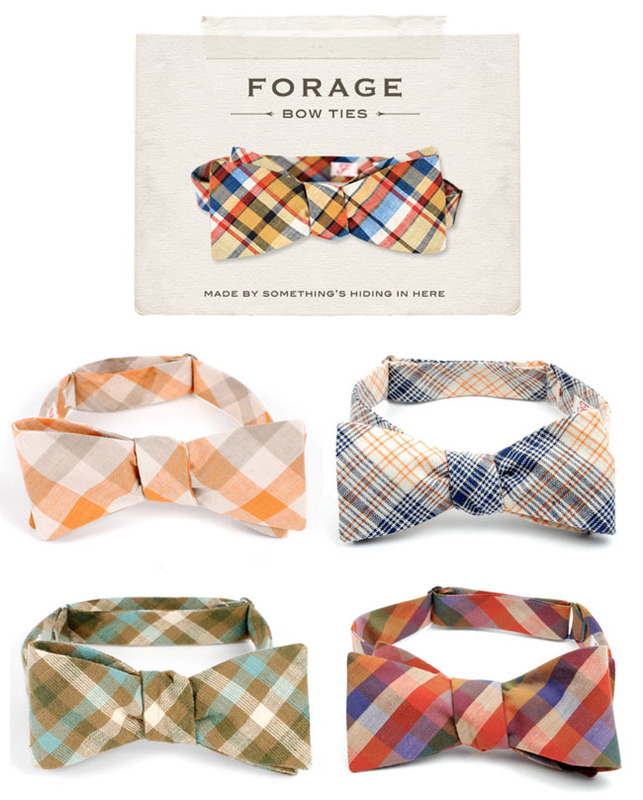 Forage uses selects their fabric very carefully and each bow tie has a limited run also. 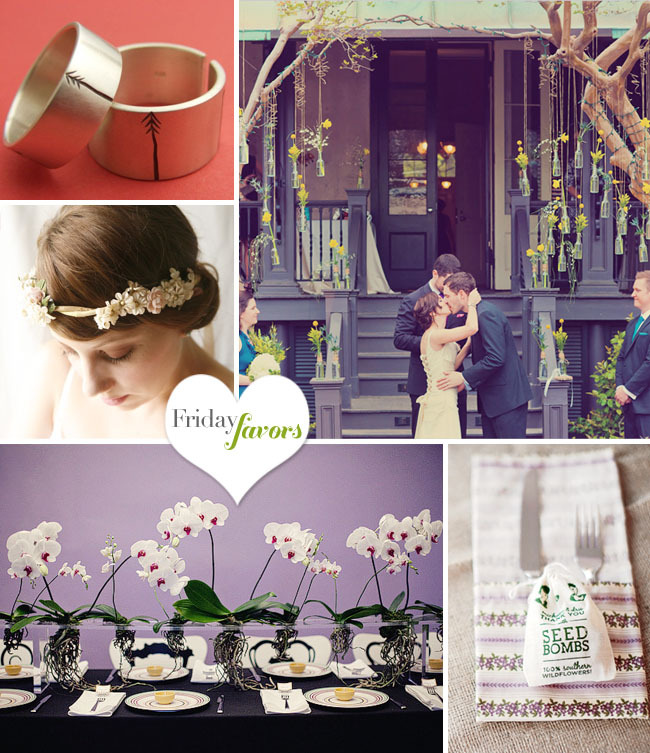 And Forage has generously offered to give this rad bow tie above to one lucky groom out there! Leave a comment with what you or your groom is planning to sport for the wedding day and I’ll pick a random winner this Friday at 1pm PST. 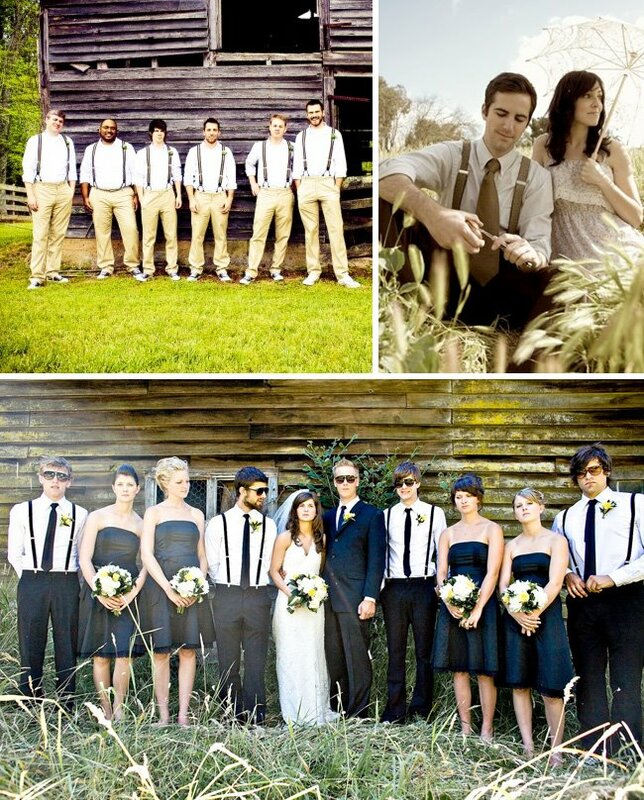 The groom wore … suspenders! 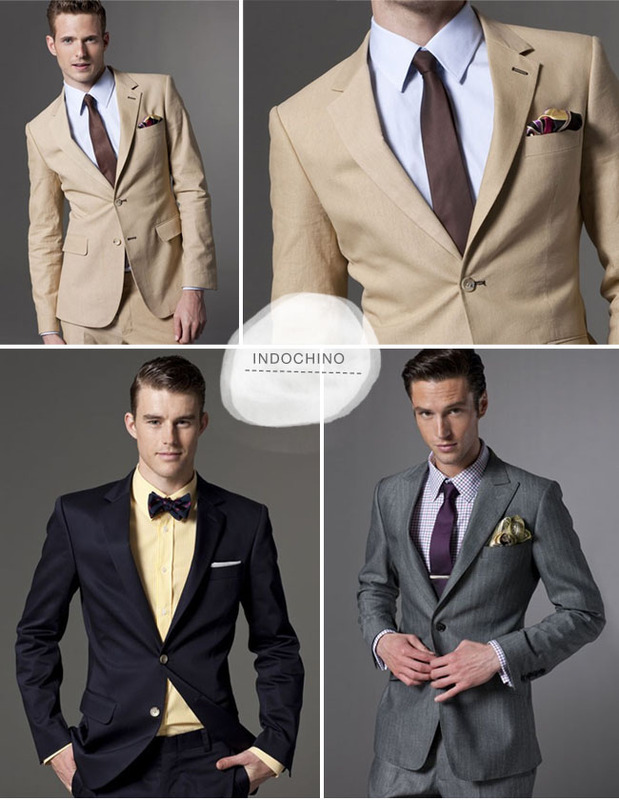 I’m not quite sure exactly what I’ll be wearing yet, but those suits from Indochino are looking likely. I probably WON’T be wearing a $78 bow tie though. Although he’s not 100% decided on color, his intention is buying a tan/wheatish or light grayinsh suit with texture/pattern like the bonobos!!! I do know this, whatever he decides, he’s sure to melt my heart and look super handsome!! We haven’t picked my fiance’s outfit yet – but this post is totally inspiring me right now! I would love if he wore a gray suit. My fiance wants to sport a classy look that’s both traditional and modern. How best to do it…? Traditional: a bow tie. Modern: an ORANGE STRIPED bow tie. Perfecto. A suit of some sort….but as for the tie…well that one would be perfect! OK, GWS, my grooming days are over … but I could put this tie to great use during my Best Man stint in France this summer. Trevor will be wearing a grey tux with custom patent leather converse shoes. We played around with the thought of Sperry boat shoes for the groomsmens. That indochino grey suit is AMAZING! 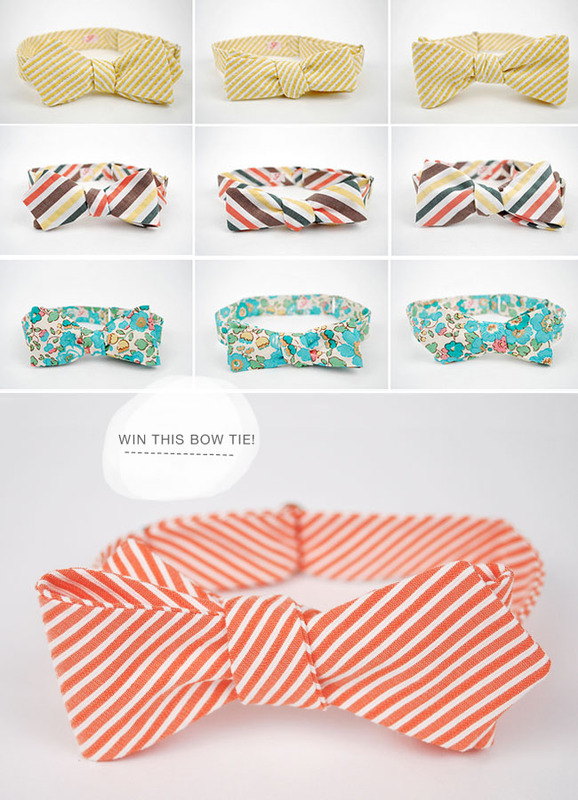 My fiance is going to sport a burnt orange tie if he doesn’t win this awesome bowtie! We decided last week that he will be wearing a suit (not a tux) with a bowtie, so this would be a perfect addition! My fiance is still deciding on either a light gray suit or a deeper navy color. Pretty sure I just found my husband one of his 30th birthday presents in those Forage bow ties….LOVE them! I’m sure Rocky hasn’t thought about it at all, and I’m not sure what he’ll say when I politely suggest light green linen pants. 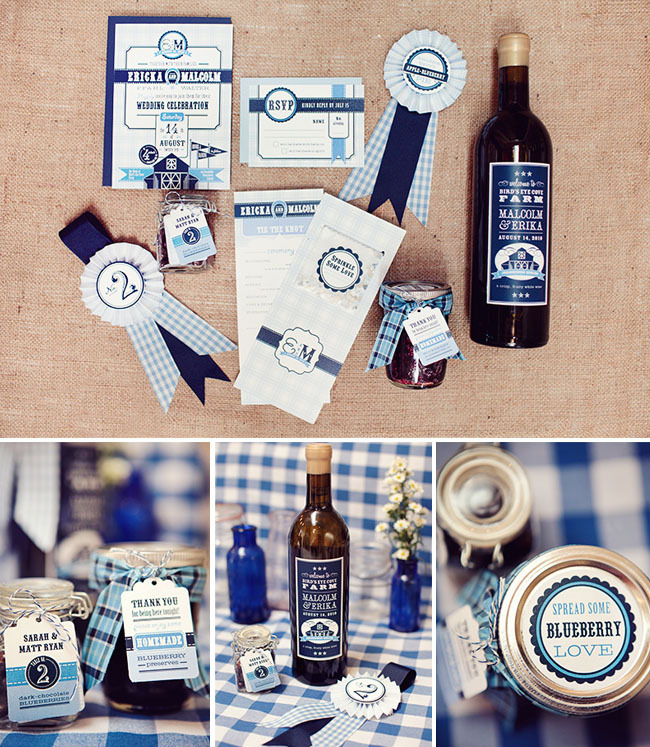 Then I’ll get him to think of how to incorporate navy and he’ll think it was all his idea. I’m sure of one thing though, he looks hot in a bow tie! mmm…..my darlin’ will be sporting a navy blue suit–with vest–and a bow tie (perhaps this one?). He will be the best looking groom ever! and he would absolutely love this bow tie! I’m hoping to get him in a gray suit… our colors are orange & blue, so this bow tie would be perfect! Our colors are chocolate and orange, i am planning on wearing a wheat colored suit. Still undecided if i am going with a skinny tie or a bow tie. This could help me make up my mind. Oh man, my fella would look fantastic in some of those suits. He’s been wanting to wear a bowtie, just haven’t looked into which style or color. But, I’m lovin’ that stripey color. This is perfect! We went with Dutchess in Portland! My man is wearing a black hugo boss suit and a green bow tie for the ceremony and a red skinny tie for the reception. I’ll be wearing a custom morning suit to the wedding, and then changing into something more casual for the reception, which will be held on the beach. Probably a light tan linen suit, and hopefully that bow tie! I am one of the only people at my job to wear one. 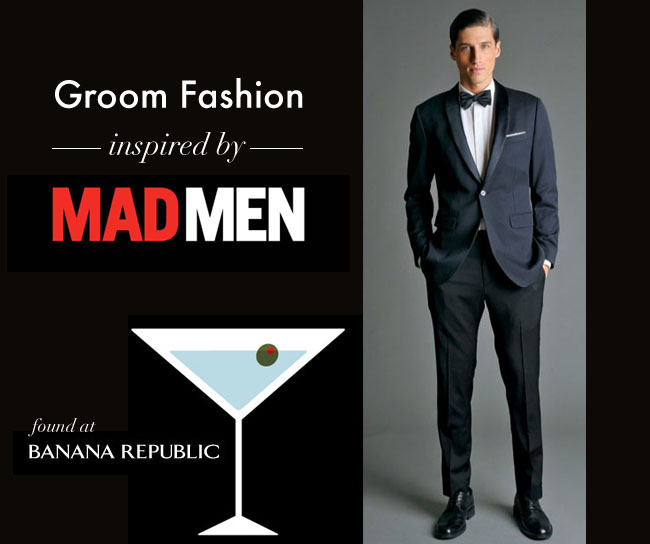 This august I’ll be rocking a Dark gray J-Crew suit, white suspenders, vintage leather shoes and a rockin’ bow tie for sure! I have these bow ties bookmarked and we have been waiting to solidify our color scheme before ordering his! He is likely wearing khaki pants with a patterned shirt and a a forage bow tie while I will be wearing a JCrew Taryn Gown. Very Nice tuxedos and ties. I really like it.